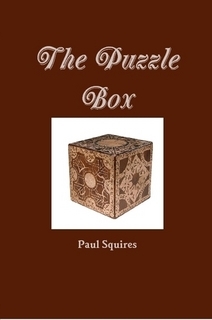 I would like to take a moment to introduce “The Puzzle Box” 2nd Edition. I was never really happy with the layout and presentation of the first edition, it had a very ‘first edition’ feel. So I employed (and at very reasonable rates I should add) the services of an experienced freelance editor, the inestimable Kiersty Boon. The book is now completely typo free, it has an index, acknowledgements, new font, a stylish cover, frontispiece, is perfect bound and is, in every way, new and improved. Importantly, the first edition has now been removed from sale, so if you own a copy of it, you are in possession of a rare and valuable asset. However, with the second edition and the application of the incredible style and precision of Ms Boon’s editing expertise, I finally feel that the frame enhances and accentuates the work. If you are preparing a manuscript, a skillful and independent eye is an absolute necessity and I do not hesitate in recommending Kiersty’s services as an editor to all and sundry. There are many ways of supporting the gentle art of poetry but none more effective and realistic than buying the work of the poets. Please consider this small investment, I guarantee you will not be disappointed.